Please call owner Dan at 608-575-3554. Boat is in Punta Gorda, Florida. 1997 custom power cat with twin 230HP diesels. 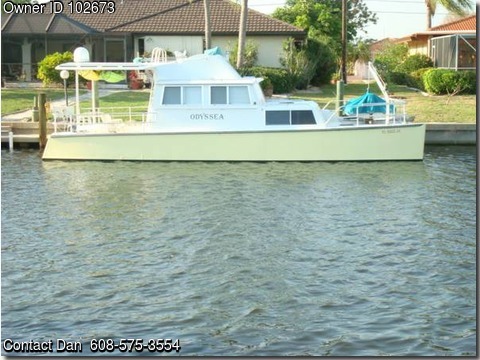 Two staterooms with queen beds, full galley with refrigerator, stove, oven and microwave. This boat has tons of room and is a great cruiser. New enclosure canvas for fly bridge. Davit for tender (tender not included). Four house batteries with inverter. New Raymarine 12" MFD with dual controls plus Down Vision transponder with CHIRP technology. Many extra parts such as two bronze props, two storm anchors and lines, etc.